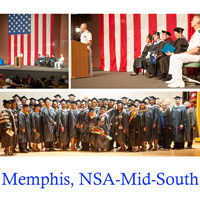 Webster University graduates were among students from four universities taking part in ceremonies at the Navy College Combined Commencement in Millington, Tennessee, a suburb of Memphis, on June 2. 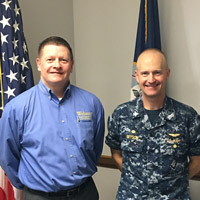 Joey Edwards, Webster University’s director at the Naval Support Activity Mid-South (NSA Mid-South) in Millington served as master of ceremonies at the event attended by about 600 people. Webster's Memphis NSA Mid-South campus location director Joey Edwards shadowed commanding officer Capt. David Bryson as part of Edwards' participation in the Leadership Millington 2016/2017 class. The collaboration includes a tour and one-on-one time with the commanding officer of the Navy site to better understand the base and its activities. First Fridays is a monthly webinar series to provide faculty with strategies, techniques and tools that increase learning and support student success. Each session will provide 30 minutes of subject matter and 30 minutes to engage in discussion, connect with colleagues, share best practices and ask questions. 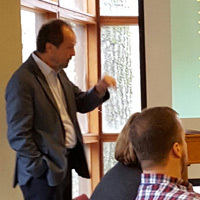 Jeff Haldeman, professor of management, led a cohort of the Bartlett Area Chamber of Commerce leadership class through change leadership and self-evaluation exercises. His visit, and a follow-up with the group planned for this summer, is part of a partnership between the Webster University Memphis NSA Mid-South campus location and the chamber. Beth Vivaldi and Shirley Johnson published Education Services Specialist," Lynn Harcarik and Bradley Ross were honored by the Memphis Chamber, Elodie Tranchez's TEDx Talk in France is available online, Jeffrey Carter was elected president of MADSOM, and Jimmie Edwards was inducted into the Missouri Public Affairs Hall of Fame.